With toys spilling over every surface of his bedroom, it was time for a toy purge. My 10 year old has moved on from many of his toys, so I was combing through his room and tossing out old playmates. With missing arms, legs, and Sharpie marks, many of the toys looked quite a bit different than they did when they first entered our home. It felt good to free up space and I happily tossed old items into a box. Then I looked next to his bed and caught the stare of a brown and tan stuffed dog with big brown eyes. As I bent over and picked up the limp animal, memories stirred my emotions. The rain poured down our hotel room window in Boston, as I played with my year and a half old son. Still feeling like a new dad, I was in awe of the little boy that he was becoming and relished our time together. But being stuck in hotel room for so long was making me feel claustrophobic. Since my wife was attending a conference, I searched for nearby things to do, but found nothing that could shield us from the rain in close proximity to our hotel. I desperately needed to get out of the hotel room, though, so I plopped my son into a baby carrier, grabbed an umbrella and trotted off to the mall across the street. As we ate in the food court, I watched kids going in and out of the toy store and figured we might as well pass time looking around the store. We walked up and down the aisles, playing with every toy within reach of little hands. As we rounded the last aisle in the store, we came to a wall-to-wall display of stuffed animals. My son walked up and down the aisle, squeezing the bodies and poking the animals in the eyes. I had always wanted my son to have a stuffed animal that he loved. I wanted him to have something to hold tight when he was scared; something to give him a sense of security. If he was tired, I wanted him to have something that would calm him down as he drifted off to sleep. My wife and I bought him stuffed animals and so did other people in our family, but he never made a connection with the animal. In fact, he was completely uninterested in every stuffed animal we placed before him. We eventually told people to stop buying him stuffed toys because it was a waste of money. But here we were – his enraptured smile taking it all in. My face lit up with a smile as he wandered up and down the aisle for what seemed like hours. Finally, I crouched down beside him and said, “Pick one.” He smiled back at me and it almost seemed like he understood how special this moment was. He turned and began to walk up and down the aisle some more, picking up one animal after another. He squeezed some and poked others. Suddenly, he stopped and reached out his little hands and picked up a brown and tan stuffed dog with big brown eyes and a red bandana. He held it close to his chest and placed his cheek upon the soft fur of the dog’s head. If there is love at first sight with a toy, that was it. We walked up to pay and there was no need for a bag, he held it all the way back to the hotel. And just like I had hoped, the dog became his companion through his darkest moments. Through visits to the hospital and nightmares, the dog was there. On plane rides, it became a pillow or just something to hold onto. But my favorite memories are of seeing him sleeping quietly in the middle of the night, his little arms squeezing the dog tightly close to his heart. So there I was purging the remnants of my son’s young years. I rubbed the lifeless dog’s head as though it understood what I was feeling. 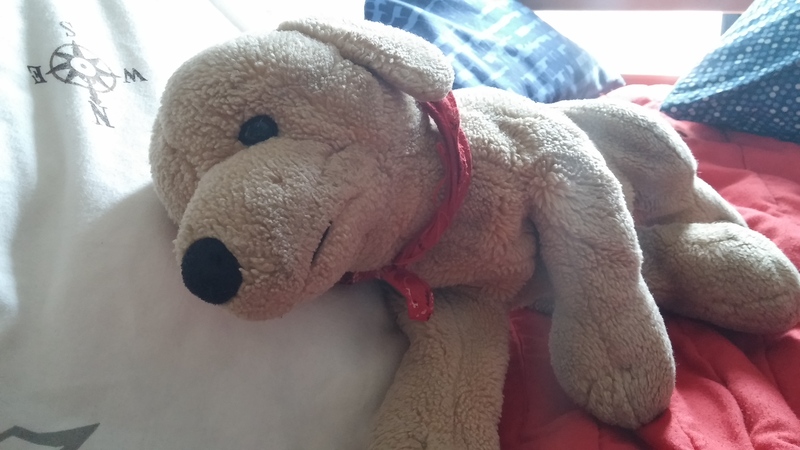 As the memories settled in my heart, I placed the dog right next to my son’s pillow, as I had done so many times before. The dog no longer comforts my son in times of need, and I do not want him to revert back to a time when he needs objects for comfort. Even so, I hope that even in his “I’m too old for that” state, he sees it and senses the familiarity that came from loving it. And maybe the time will come when he has a son or daughter, and places his old friend within the arms of his child. Or better yet, I hope he keeps his old friend in mind as he encourages his child to choose their new best friend.